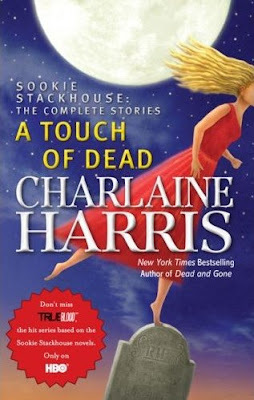 A Touch of Dead from Charlaine Harris is due for release October 6, 2009. It is a collection of Sookie Stackhouse short stories although apparently it is not a complete compilation. The cover is by Lisa Desimini, designer of all of Harris' other covers. Dallas over at the Loving True Blood in Dallas blog has the most up to date information on the collection. The next full length Sookie book Dead and Gone is out on May 5, just a few weeks away. Can't wait! I can hardly wait for the new Sookie Stackhouse book, Dead and Gone, I didn't know about A Touch of Dead, so I have another one to forward too. You got my heart pumping! Harris can do no wrong in my eyes. Te-he! Yeah, I heard the books that have the original short stories in them go for like forty or more dollars on ebay. Out of print and all that. If you have them...better sell them now. Oh! I can't wait for this. I've read all the Sookie books now and I'm counting down the days till Dead & Gone is out. 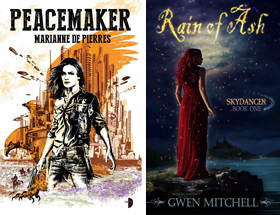 Princess Allie yeah a collection towards the end of the year should tide us over until next years new Sookie book. As for her collectibles, I think I have all of her other appearances except for the 2004 out-of-print Harlequin which is being reprinted this fall anyway. Bella I have mine on preorder too! Glad I stumbled on this here! Now I need to add it to my sidebar. *g* Cannot wait to read it. Harris books are a must for me too Kmont. I am hoping there are a couple of stories new to the collection. Oh, I have to say I'm looking forward to this one even though I've read most of her short stories. Thanks for sharing, I didn't even know about this book happening. I have several of the Sookie Stackhouse short stories but not all of them, hopefully this will have some that I'm missing. This is so kewl! Lady-tink it will be nice to have them all in one place. Fantasy Dreamer I'm hoping there are couple of originals too! I have to say this Charlaine that your books(SOOKIE STACKHOUSE) are amazing . Very touchy ,lots of emotion in the character ,and deadly Romantist.i'M TOTTALLY FALL IN LOVE WITH s.sh SERIES. AND i can't hardly wait to see " A TOUCH OF DEAD ' coming out soon . Also do you know whether the oher books - that go in between the books throughout the series - are adding to the story or just elaborating on what has already happened..
Hi Jazzy. Some good questions. A Touch of Dead is actually a collection of Sookie short stories. They fill in a little bit of back story but none are really essential to the continuity of the series.